Yesterday I finally left the house for work and resumed my normal routine - I'd love to tell you I accomplished a ton around the house but that would be a lie. As much as I enjoyed having extra chill time I don't enjoy when my routine gets thrown all out of whack so it was good to get back to normal life - plus this means that mail delivery resumed! Mail delivery is always exciting for me since I get a decent amount of packages throughout the month and yesterday was exciting because my mystery mailers from Prep Obsessed arrived; this month I purchased both "The Big Game" mailer and Valentine mailer. The big game mailer promised a Prep Obsessed signature tee and five game day essentials - I always try to get the mailers that include a tee as I love Prep O tees and would buy them anyway - then the items included just becomes a bonus. This mailer did not disappoint. 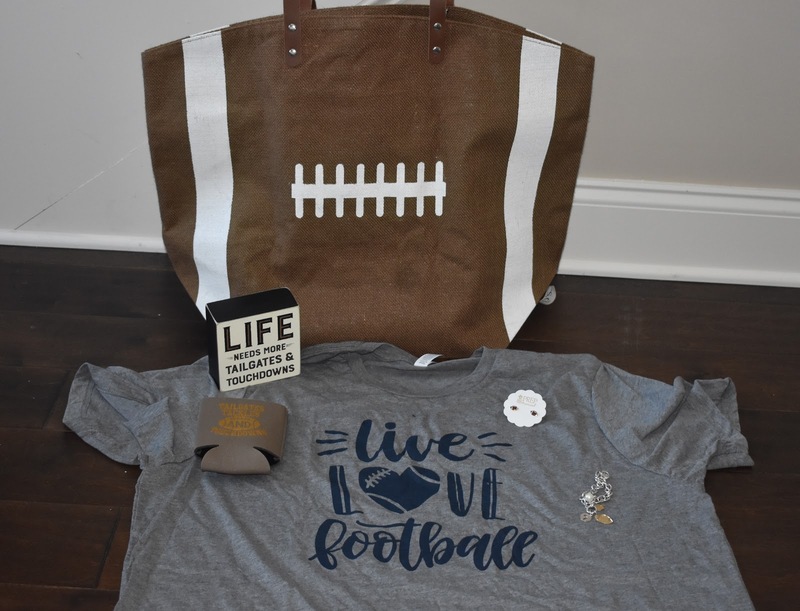 Football tote - I was very surprised to receive this item as it retails for $22.99 on it's own and it's a pretty big tote. I personally would have preferred the one that looks like a football field and I am hoping someone wants to trade with me but if not I like this tote enough to use it. Football bracelet - I was surprised to receive two football jewelry items but I'm not complaining, It's a nice bracelet. Koozie - this was another item I expected as the Prep Obsessed girls love koozies; I personally do not but their inclusion doesn't bother me. I'll probably put out a backset of them for everyone beer for our Super Bowl party. Decorative block - I'm meh on this one, it's not a bad item but I just don't have a place for it. I was thinking we would get cocktail napkins or a table item since so many people attend or host super bowl parties and cocktail napkins are a pretty frequent inclusion in Prep Obsessed mailers. This mailer is $39.99 - there's still some available - and best I can tell it's at least $80 worth of products so not having a use for one or two items doesn't really bother me and I'm very glad I purchased this mailer. The Valentine mailer promised a pair of slippers and six valentine essentials. Prep Obsessed has been selling a ton of the snoozie brand slippers so I strongly suspected they would be included and figured there would be a few jewelry items, a sweet treat and a koozie. Slippers - While this mailer did include the snoozie brand I was super disappointed that it was a plain pair, the whole appeal of them seems to be the cute designs and while no doubt these will be warm they're not cute or exciting IMO. Heart earrings - I had been hopefully that the glitter heart earrings Prep O had featured earlier would be the mailer but these are cute too, design varied by mailer but it looks like everyone received some kind of heart stud. XOXO Tray - this is really cute but not something I need or would have purchased. We have a black and white décor going on in our guest room so I'll probably stick this on the dresser. Chocolate Covered Strawberry Lipgloss - I hate this item, it smells yuck and I will never use it. I suspect a lot of women will be passing this item onto their daughters. Candy - the lollypop is cute but I could do without it. But I fully anticipated that it wouldn't be six actual Prep O products and candy would be one item. The Prep Obsessed ladies did say that this mailer would be appropriate for a younger audience but I didn't think appropriate meant targeted to them. Also this mailer was $34.99 with the value supposed to be over $70 and I'm having a hard time seeing that and to me quite frankly it wasn't even worth the $34.99 I paid. I find myself wishing I had bought the earrings I liked and the cute snoozies instead. I will say that a lot of ladies have been asking for a mailer for their daughters and I appreciate the attempt Prep O made - if I had a daughter I could have seen the clutch, lip glass lollipop and maybe even tray being perfect for her but I don't think having one that's kid friendly will also appeal to adults. I'm sharing this review not to complain but to be authentic and demonstrate that my reviews are honest. I typically LOVE the Prep O mailers and this is the first one I have received after years of shopping with them I have been disappointed in - hey you can't win them all. This doesn't stop my love of their store and it won't keep me from buying future mailers but now you know when I say I love something it means I love it because if I don't I'll say so. And I really do LOVE The Big Game Mailer so it was still a good mail day.